Sacerdotus: Invitation to Debate: Will Pusillanimous @atheismnthecity accept? Invitation to Debate: Will Pusillanimous @atheismnthecity accept? Recently, an alleged atheist on Twitter messaged me after my account tweeted a scheduled tweet promoting my book Atheism Is Stupid. 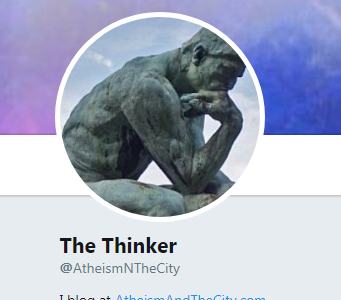 A follower of mine replied to his/her tweet and this was how I was made aware of the existence of account @AtheismNTheCity. My filters are on so I only see tweets from people I follow. AtheismNTheCity is unknown in the religious/academic debate square. Despite other atheists calling him/her out on his/her disastrous post, he/she insists they are irrefutable. I challenged atheismnthecity to a formal debate on either YouTube or Rationally Faithful and to date, he/she has not followed through. So I will now again invite him/her to formally debate me and will have my global audience as my witness. I will be waiting for atheismnthecity to accept by commenting on this post, Rationally Faithful or by emailing me. He/she will have a week to respond. If atheismnthecity lets the week pass then this means he/she does not wish to debate me formally and this will prove that his/her reasons cannot be defended and that he/she is incapable of debating. At first, it seemed as if alleged atheist @AtheismNTheCity was going to follow through with the debate, but unfortunately, that was not the case. He/she messaged me on Twitter with full knowledge that I do not monitor Tweets. I assume he/she did this believing that my lack of awareness of his/her tweet equates to me avoiding a debate. I already said I'd debate anytime on any platform, but I will not agree to the ridiculous rules. You can't have the sole rights to the material. 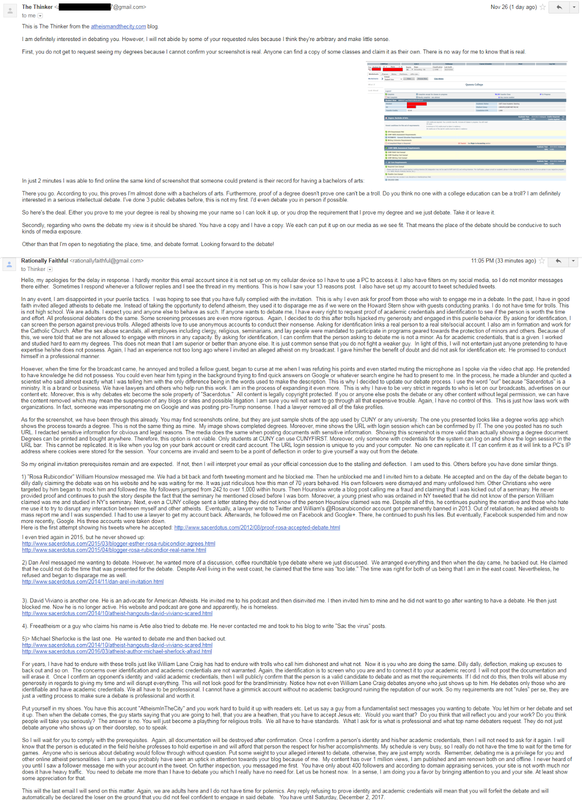 I get to reproduce it on my blog so as to ensure you don't edit it in a way that manipulates what I said or wrote. I've accepted the debate. I'm just not doing it on those silly conditions. Your screenshot is not proof of graduation as anyone can fake that easily. I've already emailed you idiot. 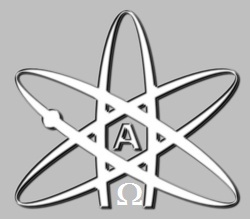 Notice that he/she is engaging in the same tact as previous alleged online atheists. 1). Refuse to provide proof of identity and academic credentials. 2). 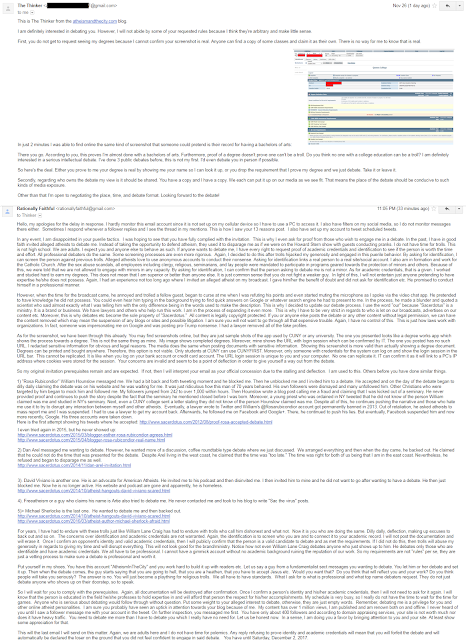 Claim that my academic credentials are fake despite the URL login session present etc. I expect AtheismNTheCity will back out from formally debating me. If he/she is reluctant on providing evidence of his/her identity and academic credentials then this means he/she has something to hide (troll identity and lack of academic credentials). His/her puerile behavior may be an indication. Look at how he/she has no regard for the disabled and is overly emotional and easily triggered. This shows he/she is not logically centered, only emotionally centered. I will wait to see if AtheismNTheCity will follow through or will run away whining about the requirements of a professional formal debate. He/she is messing with the big boys now. So he/she has to man up and step up his/her game or go home. There is no crying in baseball and there is no whining in debating. Let's see if he/she wants to debate, or will back up like Michael Sherlock and company. He/she claims so in his/her posts, but to date, no formal response here, Rationally Faithful or my email. It looks like he/she will be backing up just like Michael Sherlock and company.